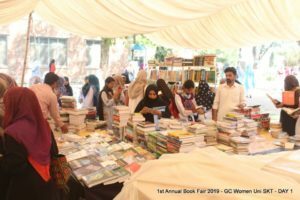 1st Annual Book Fair 2019 was organized by The Library Society, The Science Society and ORIC – GCWUS. 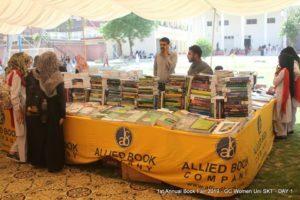 More than 20 publishers exhibited their books in the University. 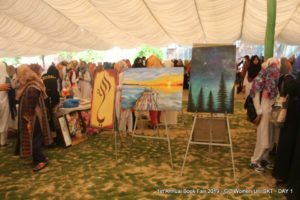 Food festival was also been a key attraction for the visitors which included females and children under age of 12years. 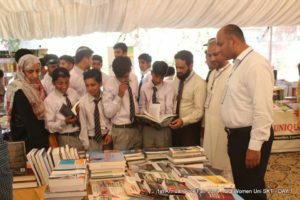 Prof. Dr. Farhat Saleemi, inaugurated the 1st Annual Book Fair 2019. 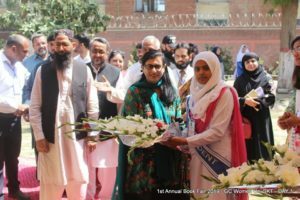 Prof. Dr. Hafiz Khalil Ahmed, Vice Chancellor, Government College Women University Sialkot, was the Chief Guest whereas former Vice Chancellor, Prof. Dr. Farhat Saleemi and General Secretary Seerat Study Center, Mr. Asad Ejaz were among the Guests of Honor. Two books were launched today, first one was written by one of our deceased faculty member and former HoD Institute of Arabic and Islamic Studies, Dr. Khalida Gillani with the title of “Khilafat e Abbasia ka Muashi Nizaam (Musalmano ka Ehd e Zarri)”. 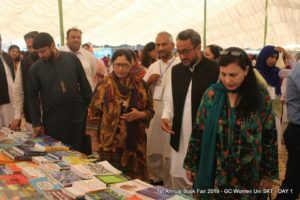 Whereas, second book was written by Dr. Sayeda Sadia, current HoD of Institute of Arabic and Islamic Studies, with the title of “Pakistani Muasharay ma Mutalliqa Khawateen kay Samaji o Qanooni Masail (Sharai Tanazur ma Tajziyati Mutalia). She had also received ‘Presidential Award’ for the same book.